Long before discovering Tarot I was an avid journal-keeper, so naturally, when I first got a deck of cards I started a new Tarot Journal. I made daily entries, and after filling multiple volumes in a short time it was apparent that this method didn't really meet my needs. Not only was I was going through books very quickly, it wasn't possible to add images without printing or drawing. Sometimes I want to record a quick spread/draw, or keep a link to a great resource or article, and I can't do this effectively on paper. Often a thought will strike me while walking the dog or I'll notice something that makes more sense of my daily draw when I don't have my journal and pen to record it. Using paper became quite frustrating. I wanted a way to instantly and effectively record things which would be easy to refer back to. 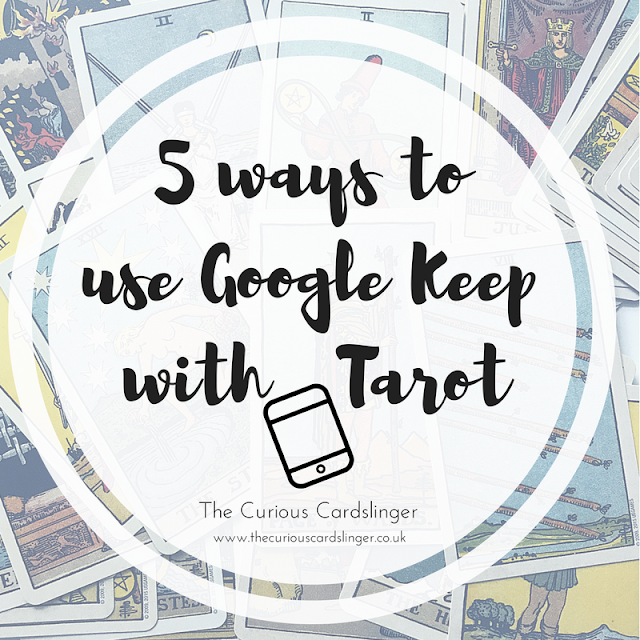 After asking other Tarot people on Instagram, I started looking at various electronic options and eventually decided on Google Keep. It's been working so well, I've put together a quick overview of some of the ways I use it so you can consider whether it would meet your needs too. Google Keep (GK) is completely free to use and accessible online. You need a Google ID to log in and your account can be used across an unlimited number of devices either via the website or the iOS or Android apps. Whenever you're connected to the internet it syncs your account with the cloud. This means you can access everything, wherever you are, if you have an internet connection. If you're not connected, you can still make entries and they will upload / sync later. It's easy to add multiple accounts if you have more than one Google ID, and you can switch between them with a couple of clicks, once the passwords are stored on your device. In this way I use my personal email address for reminders, shopping lists and other mundane things, while my Curious Cardslinger account has become a true multi-media journal. Here's a screenshot of the overview page which can either be arranged like this (tile view) or to show your entries in order (most recent first). As you can see in the image above, I include any spreads I've used, a photo of the cards drawn, my interpretations and thoughts, and also links to my own blog posts based on the draw, or to other resources such as YouTube links, shows on Gaia, interesting articles and just about anything else I might possibly want to refer back to as, this being a Google product, it's easy to search your content. The app is only limited by the lack of formatting options, but considering it is free and is so simple to use, that's something I can happily live without. Save a spread image, a link to the original source, your own reading, interpretation, and an image of the cards drawn all in one place! If you blog it or add it to Instagram, you can link that too. If you've seen my post The 5 Cs of Working with a Daily Card, you'll know that I love to select a card of the day. It's so easy to take a quick snap of the card and save it on GK with the date and initial reactions to it and then to come back to it throughout the day. If you type the name of the card in the text, or use the name as a label, you can also call up all posts for that card and refer to anything you previously wrote about it. There are loads of great Tarot challenges on Instagram (check out Tarot Prose, Lion Harts, and Divination Challenges for starters). It's easy to keep track by adding the prompts/overview image as an entry and then saving the #hashtag as a link in your GK entry. If you're joining in, and find it as tedious as I do to type on the Instagram app (IG), you can compose your post in GK and then copy and paste the text. I do this for most of my IG posts as it's so much easier than typing directly into Instagram. If you do in-person readings for other people, you might like to save a photo of the cards drawn and any relevant notes, for future reference. NOTE: I haven't tried this for readings but you can record your voice and have it converted to text. It's not always 100% accurate (I have a Welsh accent, you may be fine) but it would only take a few edits to make it so. As I've only used short recordings, I did a search to find out about maximum recording length and it seems to be unlimited, but note that it will stop recording after a long pause. I'd definitely recommend trying it out before relying on it, but it seems like it could work, especially if you just want to summarise the reading when it's concluded. I do love Pinterest, but a while ago I deleted the app from my devices because (a) it was a totally addictive time-sucker for me - I'd lose hours to it every time I opened the app, and (b) a lot of the things I wanted to save were in Private boards anyway. Now I use GK to save everything related to Tarot, Oracle Cards, and Personal or Spiritual Development. 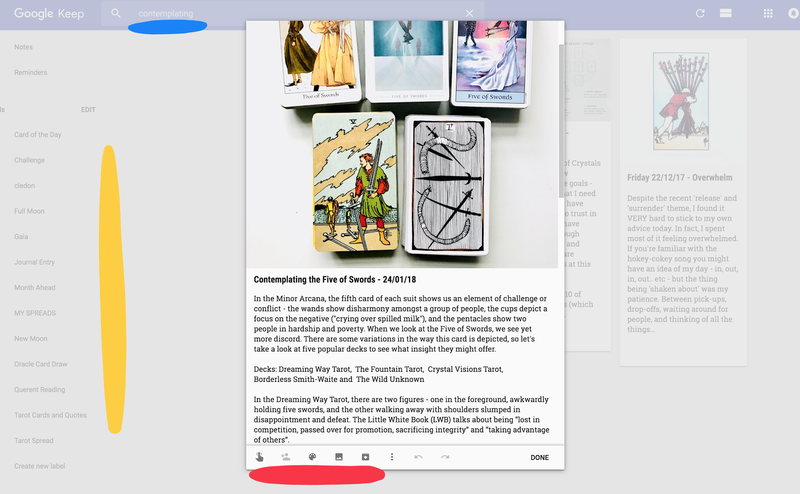 I love that I can group things together in a single entry so that I don't have to have 'boards' for things that are on the same topic - they can all be in a single place. For example, if you have ten different full moon spreads, you can add the images or links to a single entry called Full Moon Spreads. It's simple, easy and efficient. 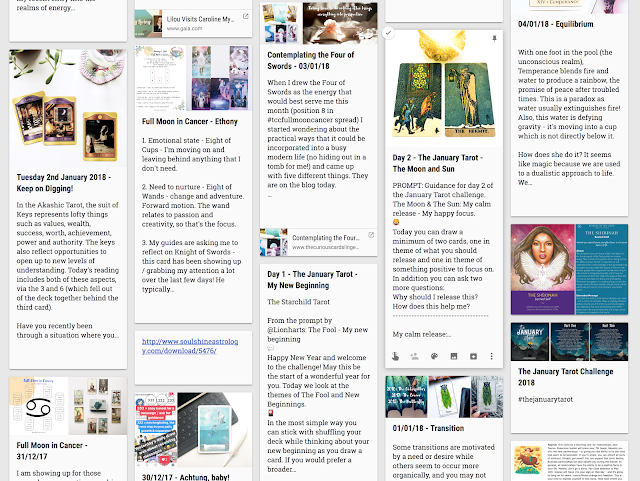 These are just a few ideas, but you can also 'pin' items to the top of the screen as reminders (such as the prompts for your daily draw), make deck wish lists and tick them off as you get them, and use it to prepare blog posts - something I do ALL the time (especially as I can edit pictures on my phone and then drag and drop them from GK onto my computer desktop and straight into the blog post when the text is ready to copy and paste). I also add links for things that I came across and didn't get time to read, and screenshots from deck apps. It's made it so much easier to manage my notes, and as I always have my phone with me it's all accessible at anytime. If you use Google Keep for Tarot and have more ideas to share, please feel free to do so in the comments. Or maybe you use something else such as Evernote in a similar way - let me know!